Adjusting dimensions and compression ratio to a desired file size is easy. I have long been looking for a good iPad app that can easily compress and resize images for my blogs. Until now, I’ve had to search out the secondary features of image-editing apps, and even then the process seemed less than secondary and more just a side-effect. And then on my last trip, I found out the app I’d been using no longer even worked on my iPad, and had been pulled from the app store. Fortunately, I was able to find Photo Resize, Rotate, Flip & Compress by Rowel Atienza. It’s not free, but it is only 99 cents, and it provides a simple interface for changing the dimensions of an image and choosing the compression ratio. You can use sliders to adjust compression and dimensions, and you can enter exact dimensions in the boxes provided. While adjusting dimensions and compression, it also recalculates the resultant file size and displays it. Photo Resize saves only as JPEG, which is appropriate since its main purpose is choosing an appropriate JPEG compression ratio. As the app’s title indicates, it also allows flipping images vertically or horizontally, and rotating them in ninety-degree increments; however, I don’t personally have a use for those features, so I haven’t tested them. Photo Resize would be perfect if it also handled cropping images, but the built-in Photos app on iOS handles cropping already, so the lack of it isn’t much of a flaw. A more glaring omission is the lack of visual feedback when reducing the compression ratio. The app only shows the compression’s degradation after hitting Done to send the image off to another app. Mind you, if you don’t like the results a quick tap on Back allows you to readjust the settings. And in its defense, the image quality after even high compression is extremely good. 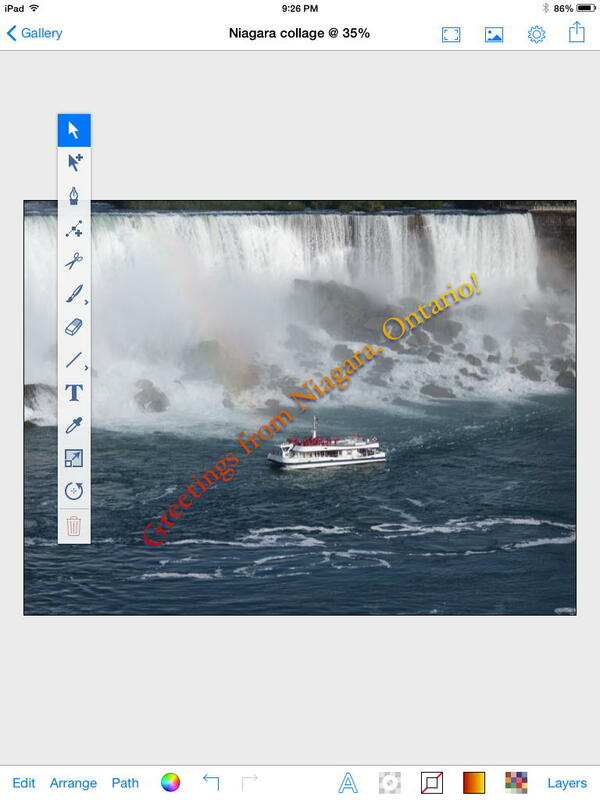 This app is a must have for bloggers and anyone needing to resize images on the fly. I’m still amazed at how many photo apps do not let you resize or compress the images you edit, and that give no feedback on how big—in file size and thus download time—your image is. And some that do, don’t even show what dimensions you’re resizing to. 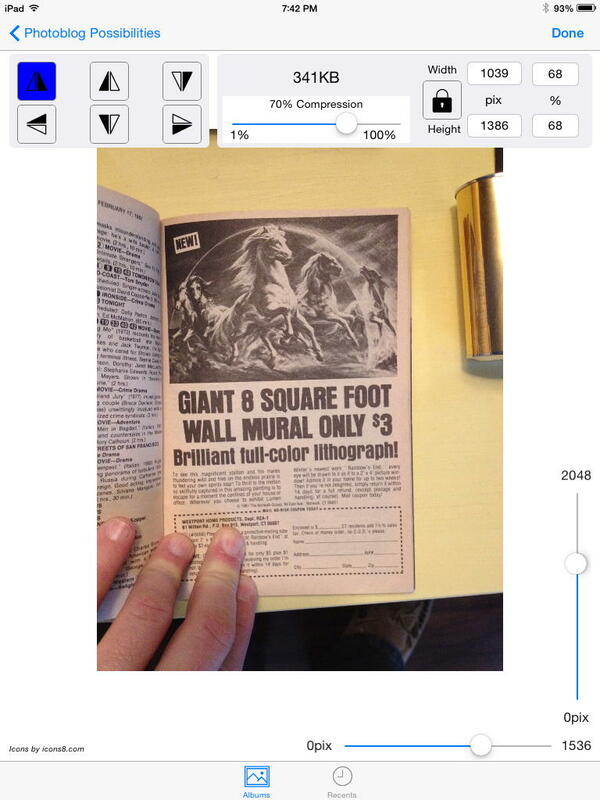 Photo Resize does both, in a simple interface. It also allows saving, besides back to the photo album, to pretty much any app that supports Open In with photos. This includes Dropbox, Google Drive, Twitter, Facebook, Transmit, Gmail, and Google+, as well as several messaging apps. Another app that’s quickly entered the must-have realm for me is Editorial. 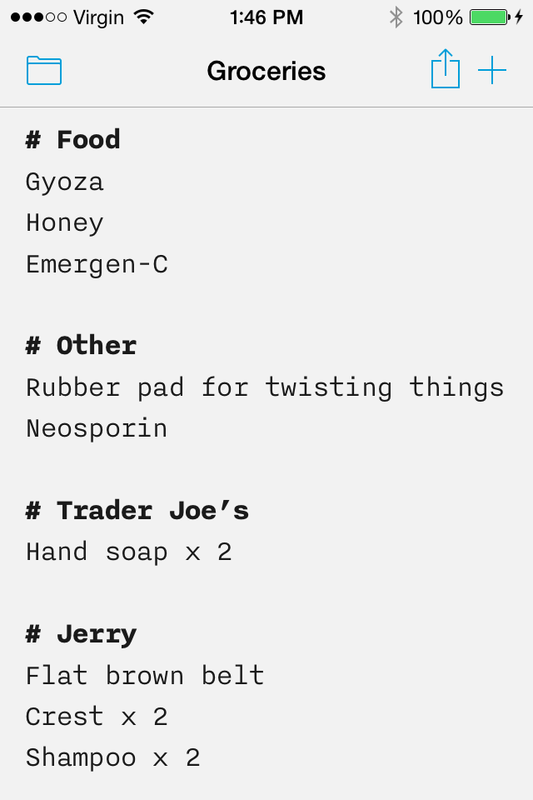 It’s basically a Markdown editor, and it’s a good one. It is a universal app, working on both the iPad, for which it was designed, and the iPhone. The undo button is on the special keyboard bar on the iPad. Shake to undo works as well, but having it on the keyboard is easier to see. I’m typing this list in Editorial, and as I hit return to go to the next item, it automatically fills out the number for me—no mode switch required. 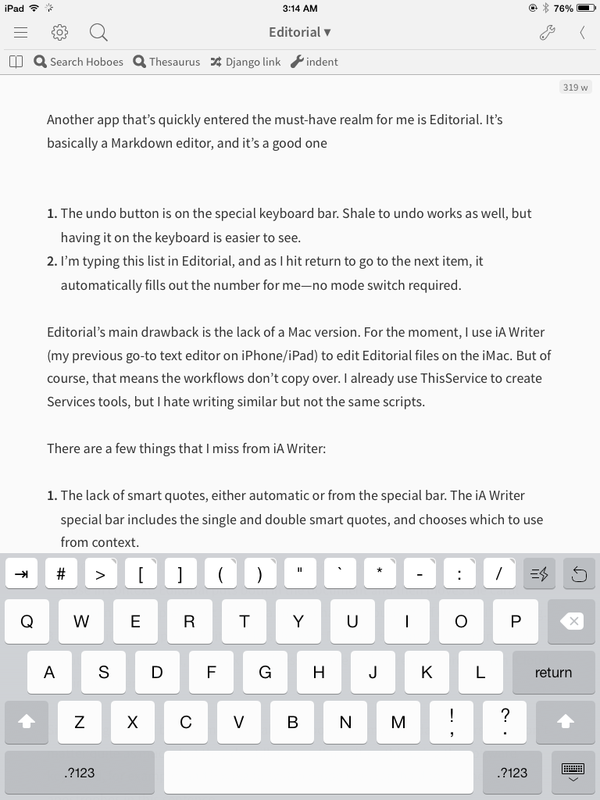 It seems simple, but it apparently isn’t—iA Writer only received this functionality as I was writing this review—Editorial displays Markdown files with formatting. A quote is indented, emphasized text is emphasized, and so on. One interesting feature—and one that’s very useful to TaskPaper users—is that it recognizes .taskpaper files and displays them as tasks with checkboxes that can be checked off. I store my task lists on Dropbox, and can then edit them both on my iMac (using TaskPaper) and on my iPad/iPhone (using Editorial). Only the iPad can currently easily check off tasks; however, the special bar of the onscreen keyboard changes to be appropriate for TaskPaper files, on both the iPad and the iPhone. Using Editorial just as a Markdown editor, note editor, and TaskPaper editor on the iPhone and iPad is enough right there. The killer, though, is the workflow feature. Within the workflow editor are simple tasks that can be chained together to form a workflow; for example, I often look on Wikimedia Commons for related imagery; I can now select the text I’ll be searching for and hit a button in Editorial to search. The web page is brought up within Editorial making moving back and forth faster. I have another workflow for blockquoting selected text. People use workflows for uploading posts to their blogs, tweeting selected text, and titleizing selected text. Workflows can be organized by tagging them, and then filtering by tags, by tapping a button with that tag’s name. Finally, workflows can include custom Python code, putting pretty much no limit on what you can do to your text in a workflow. Must-have iOS apps last modified September 14th, 2015.